Hello! 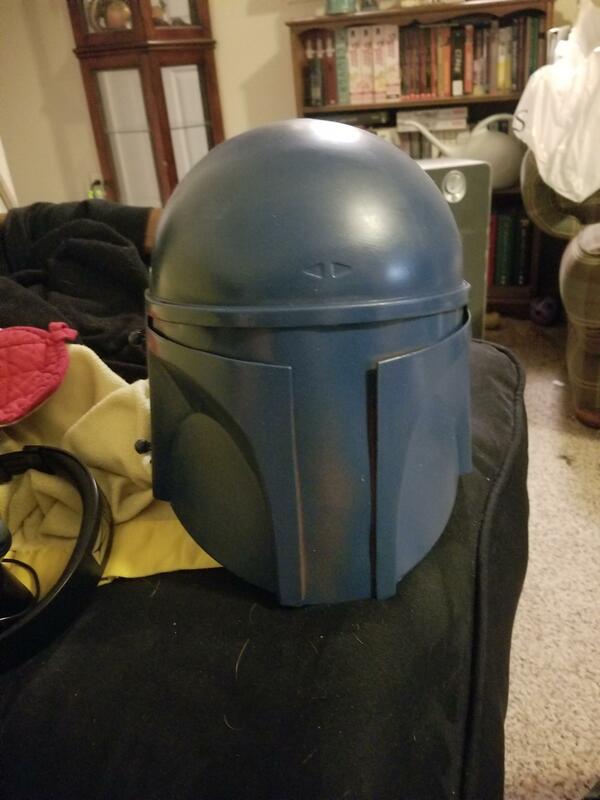 I have recently acquired a ruby's two piece Jango Fett helmet. This will be my first bucket build and naturally I have a few questions in the building process. When should I remove the visor? I've read through a few conversion posts but no one I've come across really says when they did it it just happened in the process some where. I'm planning to do a fiberglass adjacent reinforcement (fiberglass resin and used dryer sheets layered) along the seams and just coat the insides otherwise. So my question here would be, do I cut it out while I still have it in half or wait till the insides are coated and the. Cut it out? Thoughts or more helpful advice? 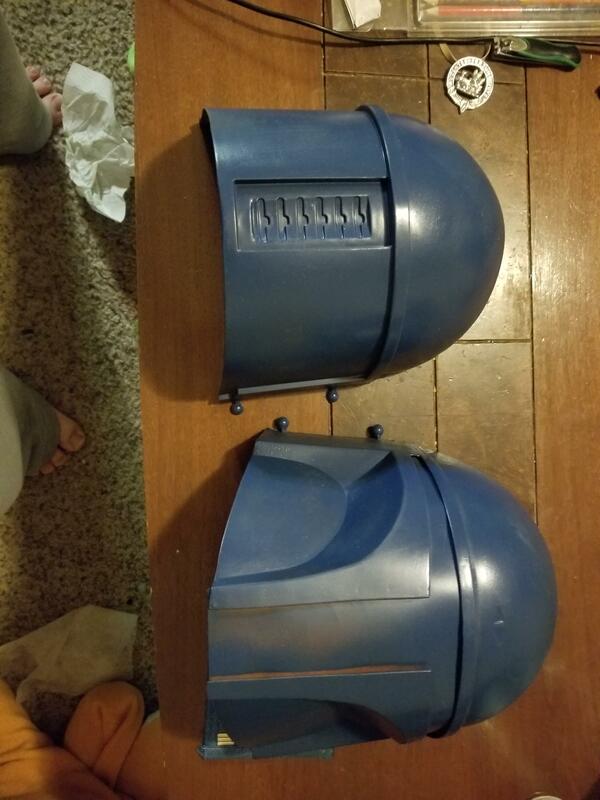 I plan to use a green tinted face shield as my first visor replacement similar to the one linked above with plans to replace it down the line with maybe something a little nicer. I've heard a few different techniques for securing the visors and I think I'm either going with super magnets in fitted sockets or super strength velcro. Again, any helpful thoughts or advice is welcomed. Lastly I've seen more than a few people get fancy electronics involved and I'm thinking at some point I will come back to install a fan and or hearing aids, microphones leading directly to earbuds or speakers to make hearing inside the bucket easier. I've seen tutorials and I'm not bad at simple circuit soldering so I think I could manage. Thank you for reading through this and leaving any helpful advice you can. Whenever you change the visor, just make sure you have the new one ready to install (even if temporarily until you are ready to paint) or a piece of plastic as a place holder. The longer you leave the T open, the greater the chance of the face warping... It needs something to support the shape. That only really applies to resin helmets. J2P helmets don’t generally warp unless they’re left in on or around something very hot. Even then they’re hard to make warp. You can pull the old visor whenever you’re ready. I’d suggest before glassing if you haven’t done so yet to save yourself back tracking on work if you accidentally cover an edge with resin. Thanks for the advice vods, I haven't gotten around tonglassing because it's been to cold here in the midwest and I dont have an indoor space to work with fumes like that. So hopefully itll warm up soon and i can get to it, until then I'm just stuck. The plural of Vod is Vode just so you have the info for later. Also I completely understand the weather being an interference with your ability to work outdoors! Taking the visor out is one of the first steps when I do them, but it's almost immediately replaced with Sintra to thicken that area and make it less obvious it's a a plastic J2P. Also, I know people swear up and down that a J2P has to be fiberglassed, but I assure you it doesn't. I've done a few of them and have yet to even think "fiberglass" while working on one. Thanks for the support Vodes, I've still been working at this since its warmed up a bit in the midwest, I tried to prep it for a resin and dryer sheet "fiberglass" but after Dekan Korr linked me that nifty thread I'm rethinking my goals. 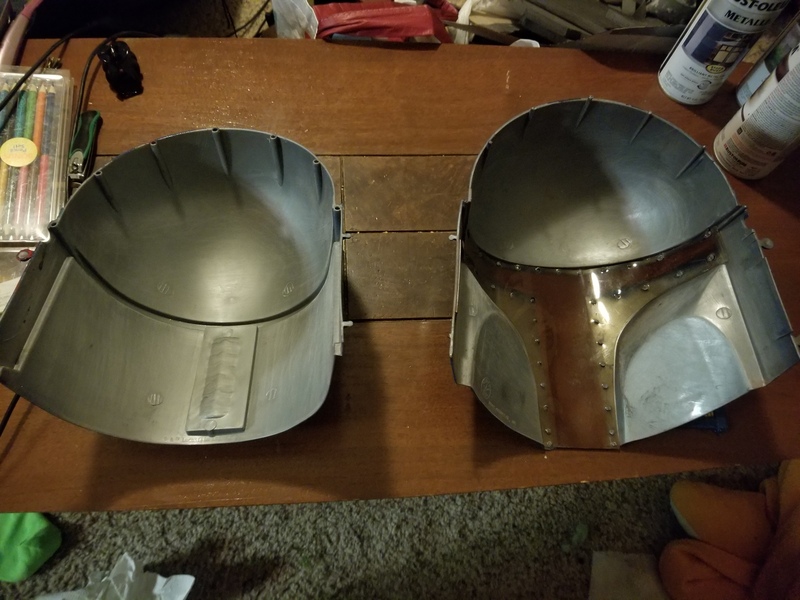 I have a visor template traced and ready to make and everything has a first coat of paint to help give some wear and tear to match the plates when it's all done. Next step is removing the visor "studs" deciding how I want to mount the visor and start hiding seams. Next question for me is that in the tutorial and on another site they talked about flattening the cheeks but honestly I dont mind them flared, is it required to flatten them out? 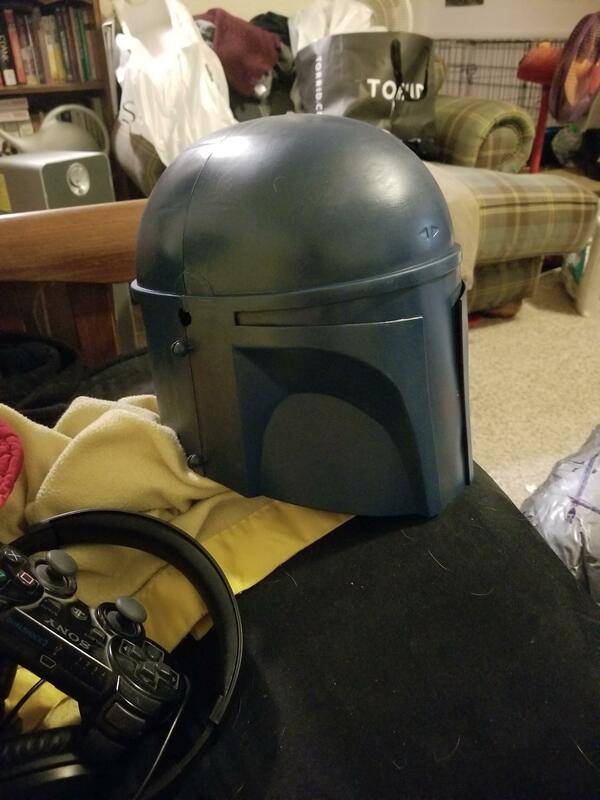 If you were doing a canon boba fett build, for approval yes. For a fun costume, or for a custom character, you do not. I'm doing this for a custom character, so for now I suppose I'll forge ahead and worry later about the cheeks. Thanks vod! Right, sorry, I was thinking of a similar question on a different thread, go forth and conquer! Definitely not a requirement to do the cheeks. I personally prefer them straightened, but that is 100% an opinion thing. Some people like to leave them curved because it gives a little extra room for your face.